Is there a better date to launch a ghostly collection of short stories than Friday 13th? Not just any group of writers but a bunch of writers with varying degrees of experience in the writing and outside world, all of which we brought to bear in the compilation of THE HAUNTINGS OF LIVINGSTONE HALL. First... we needed to have a degree of consistency to all our stories, so we chose an old house, agreed (roughly) on a floor plan and decided all our ghosts had to inhabit this house. Second... large pieces of butcher's paper and a ghant chart (yes, one of us is a project manager). Allocation of roles and responsibilities (one is a former army officer) and we were off. The result is THE HAUNTINGS OF LIVINGSTONE HALL... reputedly the most haunted house in England. With 7 authors there will be 7 wonderful prizes on offer. I will be giving away an autographed print copy of my 'haunting romance' GATHER THE BONES and a pair of spooky earrings - perfect for Halloween. The Grey Lady is only seen when the last male heir of the Compton-Barrs will die a violent death...But the Compton-Barrs have left Livingstone Hall. There are no male heirs... or are there? ​‘Oh dear, this can’t be good,’ Hector, Head of Ghosts, muttered. A bright red Italian sports car, followed by a dark blue van swept around the bend of Livingstone Hall’s weed infested driveway. The sports car skidded to a stop outside the old house and the van drew up beside it. For months, the spectral inhabitants had endured a circus of real estate agents, and potential buyers, traipsing through the house. A few had been dissuaded with judicial and strategic shoves in the back and unexplained tripping but nothing could deter the odious Herbert Boxell Junior the Third, or HBJ3 as he called himself. A succession of architects and builders had crawled into every conceivable nook and cranny, shaking their heads about the dry rot, the state of the trusses, the death watch beetle and other structural issues. Even worse, blue print plans had appeared on the library table waiting for perusal by HBJ3 and his minions. Hector had reported to the other ghostly inhabitants about plans for roof top golf, an indoor swimming pool, a health spa, pedalos on the lake and even more alarmingly, a basement disco. ‘That sounds rather fun,’ Freddy and Paradise had agreed. The others just stared at them, and the White Lady moaned and dripped water. While the attempts by the ghosts to deter HBJ3 had gone unregarded by the man, he seemed to take an unhealthy interest in them. Hector had overheard him asking the agents about the reputation of the hall as the ‘most haunted house in Gloucestershire’ and when assured that, yes indeed, there were numerous stories about the place being haunted, HBJ3 had responded by rubbing his hands together. I have said it before and I'll say it again... 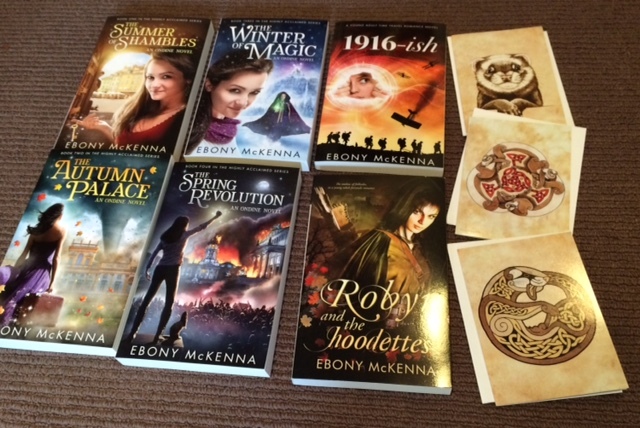 I LOVE Ebony McKenna's quirky sense of humour and her fabulous offbeat, fantasy stories. They may officially be 'Young Adult' but they are definitely for the young at heart! Two of these paperbacks and all three cards could be yours. Actual rafflecopter code starts here: a Rafflecopter giveaway Rest of post is here OK - slight problem I've just been made aware of. The link to leave a comment isn't working, so just leave a comment down the bottom here, then come back up and click 'I left a comment' on the section and that will work. 3 supercute ferrety cards with envelopes. I honestly can't remember what I paid for them at an etsy shop, but they're so cute! 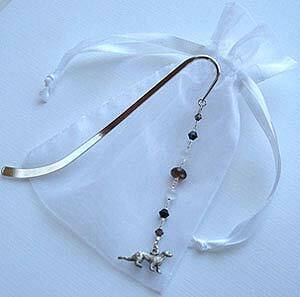 Here is the bookmark you could win. Isn't it adorable? 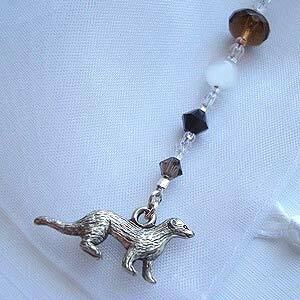 You slot the long silvery bit into your book, and the bling ferret hangs on the outside. I'm pretty sure if you did it the other way, the bling would seriously crumple your pages and nobody wants that. The competition is open to people all over the world. I will pay the postage. All you need to do is follow the Rafflecopter instructions. The more options you choose, the more entries you'll have. At the end of the competition, Rafflecopter will choose two winners at random. Then I'll contact the winners via email and we can discuss which two of my six novels they want, and I'll stick it in the post. Want to know what all my books are about? Why am I so keen on ferrets? Yeah, it all ties in. The four Ondine novels are about a teen girl whose pet ferret, Shambles, starts talking in a Scottish accent. It's set in the crazy eastern European country of Brugel. Trust me, these four books have really put Brugel on the map! Shambles is really a man living in reduced circumstances. He offended a witch and she cursed him good and proper! Robyn & The Hoodettes is a young adult gender flip retelling of the Robin Hood legend. It's so much fun. Robyn is a headstrong peasant with a knack for getting into trouble. Her best friend, Marion, is the local blacksmith who yearns for adventure. The two of them fall headfirst in trouble, and a little bit in love along the way. 1916-ish is about three students who join a reinactment of a battle from World War One, and end up in the real thing. Ingrid is 16. She's out of place, out of time and out of Ritalin. Good luck and may the ferret be with you!